Libby qualified from the University of Ulster in 1983 and has specialised in Rheumatology. She worked for many years as a Senior Physiotherapist in Musgrave Park Hospital, Belfast, and her work included Hydrotherapy andSpecialised Exercise. 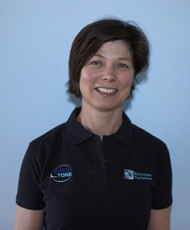 Libby joined the Clinic in 2003 and has now specialised training in Pilates with both Body Control Pilates and The Australian Physiotherapy & Pilates Institute. In her spare time she is involved with Riding for the Disabled.